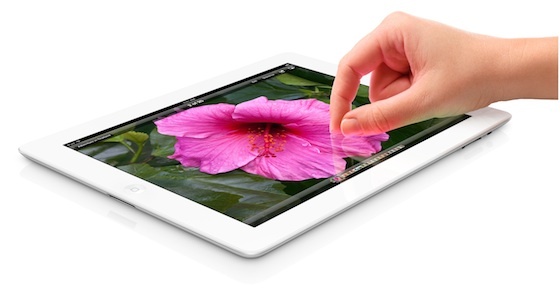 Apple today introduced "the next iPad", the latest generation of the company's popular tablet device. Offering a Retina display measuring in at 2048 x 1536 pixels, Apple claims that it is "redefining the category Apple created" with the original iPad. At 264 pixels per inch, the new display is considered Retina quality with indistinguishable pixels when held at the typical viewing distance of 15 inches. Featuring an A5X system-on-chip with quad-core graphics, the Retina display offer 44% greater color saturation than its predecessor. All of Apple's stock apps have been optimized for the new ultra-high resolution display and existing apps from third-party developers will be automatically scaled up with text rendered for the new resolution. With additional work, developers can also optimize their entire apps for the new display. On the camera front, the updated iPad features a 5-megapixel rear camera with advanced optics very similar to those found in the 8-megapixel camera on the iPhone 4S. 1080p video recording is also supported. Voice dictation as found on the iPhone 4S is also included. Cellular-capable models of the new iPad also support 4G LTE as had been rumored by multiple sources. Supporting data speeds of up to 21 Mbps on HSPA+, 42 Mbps on dual-carrier HSPA+, and 73 Mbps on LTE, the new iPad offers a significant improvement in cellular data capabilities. LTE partners include AT&T and Verizon in the United States and Rogers, Telus, and Bell in Canada. Due to differences in frequency bands, AT&T and Verizon support will require separate models. On the battery life front, the new iPad offers the same levels as before: 10 hours on Wi-Fi or 9 hours on 4G LTE. As for the device's size, it comes it a scant 0.6 mm thicker than the iPad 2 at 9.4 mm thick, and weighs 1.4 pounds versus the 1.33-pound iPad 2. Pricing remains as before at $499/$599/$699 for Wi-Fi models and $629/$729/$829 for 4G LTE models, with capacities coming in at 16 GB, 32 GB, and 64 GB. The new iPad launches on March 16 in the United States, Canada, United Kingdom, France, Germany, Switzerland, Japan, Hong Kong, Singapore, and Australia. 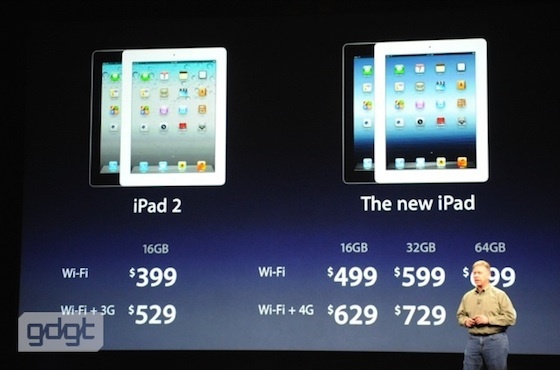 Apple will also continue to offer the 16 GB iPad 2 in both Wi-Fi ($399) and Wi-Fi + 3G ($529) models. OK what a joke of an update. After the 4s how could anyone expect more. So this is being marked as retina at 264 ppi. Oh wait that's at 15 inches away. Gotta love Apple and their marketing words. But of course they tailor their marketing to the level of intelligence of their customers. So you can't really fault them. Do you hold your tablet as close to your face as you do your phone. If you're still so annoyed go and build your own true Retina Display tablet and ship it. The naming convention is going to be a bit weird. Wait til the "really new ipad" comes next year. Very surprised at the lack of a front-facing HD camera (like those in an iMac or MBP). But then again, the MBA doesn't even have one. Hopefully it's still improved though!